Once a week, my co-worker Aaron and I, work out heavy, so I felt that this is the opportunity to do the Vpx stack along with a random protein shake, in this case a monster milk. I did cut out using friction with all of this in fear of a heart attack. I will use the same stack next week and see the gains from week to week. But, the first week using this supplement stack made me feel jittery, but it was nicely counterbalance with the complex carb supplement. 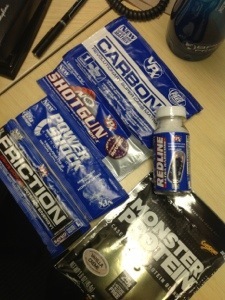 Next week I will mix the carbonox and the power shock. We’ve been exercising this way for more than a month now, so any net gains I’m sure come from work and dedication, but the supplements provide a nice kick in terms of energy, motivation, and a little placebo effect, any advantage helps really.